"Mean Bean Machine" redirects here. For the 8-bit version, see Dr. Robotnik's Mean Bean Machine (8-bit). For the Sonic Mania boss, see Mean Bean Machine (Sonic Mania boss). Dr. Robotnik's Mean Bean Machine is a Sega Mega Drive puzzle game, based on the earlier Japanese puzzle game Puyo Puyo. It was released to the North American and European markets in November 1993. 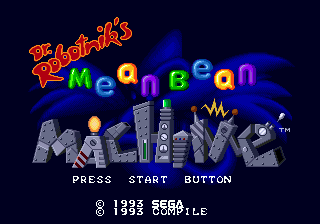 Unlike other Sonic the Hedgehog games, Dr. Robotnik's Mean Bean Machine occurs in the universe of the show Adventures of Sonic the Hedgehog, featuring its version of Dr. Robotnik and his cohorts Scratch, Grounder and Coconuts). Sonic himself does not appear in the game and is never referenced - instead the protagonist is thought to be a character called Has Bean, who can be seen dancing during each match. Robotnik has hatched a plan to ensure that no music or fun remains on the planet Mobius. To do this, he kidnaps the citizens of Beanville and stuffs them into a giant robotising machine called the Mean Bean-Steaming Machine (hence the game's title) to make them into his robot slaves. The player must foil Robotnik's plans by defeat each of the 12 robot guards, and finally Robotnik himself, to foil his evil plans. Their battles take the form of competitive puzzle gaming. Mean Bean Machine entered production before Adventures of Sonic the Hedgehog had aired, so characters in the game do not accurately reflect those in the show. Eight of the robots were in fact stated as bounty hunters hired by Robotnik to stop Sonic in the first episode of the series, and all, save for Dragon Breath in Stage 11, lack speaking roles (and are subsequently not seen in the series again). Two players compete, each with their own rectangular play area comprising a grid 12 beans (previously Puyos) high by 6 wide, meaning that 72 beans (including garbage) can fit. Various colours of beans fall into the play area. The player must attempt to place four identically coloured beans adjacent to each other, at which point they will disappear. A player loses when beans pile to the top of their play area (actually the third column from the left), so it is essential to clear as many beans as possible, in order to keep the screen empty. Players can send Refugee Beans (aka Garbage, and Ojyama) to their opponent's play area by creating chain reactions. These beans are both annoying and helpful: they can only be cleared when adjacent to another bean that is being removed, but they are very useful for making chain reactions. The more beans that link up, the more garbage is sent. Players may also activate step chains (aka Rensa) so that even more garbage is scored. If garbage beans fall into the player's play area, they cannot be grouped like normal beans (i.e. 4 in a row will not disapper) Garbage is erased when a neighbouring group of beans erase (e.g. if a vertical line of 4 beans in column 2 forms adjacently next to a vertical line of 4 garbage beans in either column 1 or column 3, the garbage disappears). However, this does not cause garbage to be sent to the opponent. This is the game's story mode, in which Has Bean must "Battle Robotnik's ranks of robot flunkies in order to save Beanville!" The player competes against computer-controlled characters in 12 stages. Most of these characters are also found in the pilot and 1st episode of the show, and each one is based on a corresponding character from the original Puyo Puyo game. The pilot even has a scene that looks striking similar to the continue screen in this game. Up to 2 players can play either in VS Mode or in Exercise Mode. In VS Mode, each player can choose between 5 difficulty settings, labeled 1-5 (Easiest to Hardest, where 1 is the lowest drop speed, and 5 is the fastest). In VS Mode, one player must defeat the other in the same way as in Scenario mode. If a player selects Level 1, they play with 4 colours of beans, however, the other levels include 5 colours. Furthermore, in Levels 4 or 5, the game begins with the play area already containing garbage: for Level 4, 18 beans (3 rows); for Level 5, 30 beans (5 rows). Exercise Mode (modernly known as Endless Puyo Puyo), is a form of practice play where 1 or 2 players can battle out. This mode has three difficulty levels: easiest, normal, and hardest (Level 1, 3 or 5). On easiest, players start with only 4 colours. To level up, the player has to keep erasing beans. Helpers (Big Puyo or Has Bean) will appear when the player gets stuck on Level 1 the first time, but they can only appear once. For Level 3, at random times, Has Bean will drop from the screen to help out. When Carbuncle is placed on a colour, it travels in a random direction, following downwards, changing all beans to that colour. For Level 5, at random times, a Big Puyo will drop from the screen. When Big Puyo falls, it occupies 2 columns of the grid, and when placed, squashes all beans and removes them from the grid. Additionally, nearly straight arrangements of Brave and Theme are in the game, but unused, and the ending cutscene music is inspired by Theme's structure. Also though Naofumi Hataya is credited as "Masayuki Nagao," he and Einosuke Nagao are completely different persons. In South Korea, Samsung released the game under the name Dong Gu Ri Te Chi Jak Jeon, however for unknown reasons, a number of early cartridges were in fact copies of the Japanese release of Puyo Puyo with the Dong Gu Ri label. An 8-bit version was later released for the Sega Master System and Sega Game Gear in December 1993. As the Mega Drive version was based on that system's version of Puyo Puyo, the 8-bit version was based on Puyo Puyo for the Game Gear. It contains an extra Puzzle Mode, which was based on the just-released Nazo Puyo. Dr. Robotnik's Mean Bean Machine did not see an official released in Japan until the 2000 PC release of Sega Archives From USA Vol.2. Note: You only get one chance to enter the code. Mess up and you have to reboot the console to try again. This page was last edited on 2 April 2019, at 20:10.